When you call Aquaman, we send a certified and specially trained leak detector. Our technicians are prepared with the most advanced equipment and the proper gear to dive your pool, locate your leak the same day. Do you suspect your swimming pool, spa, or hot tub has a leak? Leaking pools and water lines can cause expensive excess water consumption and lead to bigger problems on your property. If you have a leak, you need quick, reliable, experienced help to you find it. Pool Leak Detection and Repair is Our Specialty! During our same day service calls, we utilize the most advanced methods and technologies to locate the leak, without causing damage to your property. In our process, we examine and test your suction lines, return lines, light conduit, pool structure, and even the main drain. We follow a routine process and know exactly what to look for and what to ask when examining your swimming pool or spa. We also service fountains and some man-made ponds that may be leaking. Finding the leak is just half the battle. We also are licensed contractors and can repair the leaks for you in most cases the same day! With over 15 years experience and excellent testimonials and reviews, we pride ourselves on doing the most thorough pool leak detection. The extended warranty we are able to offer our clients speaks to the pride we take in our work. With our patented leak detection technology and our experienced and trustworthy staff, you can count on a good experience every time and warrantied work. We even get calls from other leak detection companies to assist on tough to find leaks. 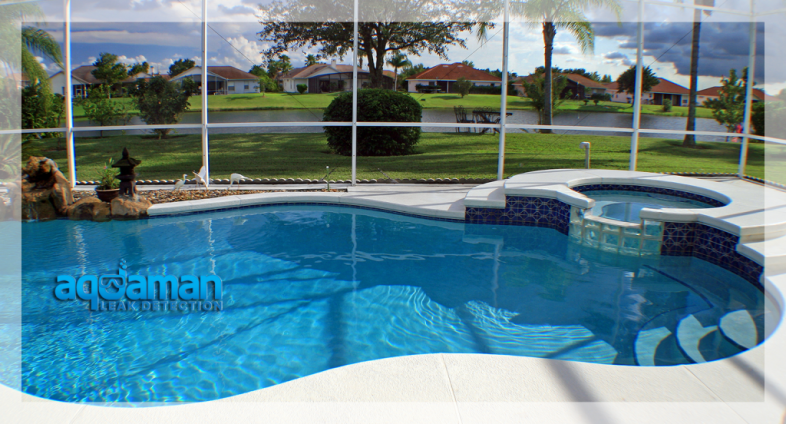 Give us a call for pool leak detection ad repair today! If you suspect a leak, but aren’t sure, you can perform a simple bucket test yourself. This is an easy way to determine if water is evaporating normally or actually leaking from your pool or spa. For instructions on how to do this, click HERE.